Advances in DNA technology have expanded so far that forensic DNA profiling is now considered a routine method for identifying victims of mass fatalities. 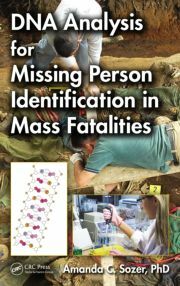 Originating from an initiative funded by a grant from the U.S. Department of State, DNA Analysis for Missing Person Identification in Mass Fatalities presents a collection of training modules that supply comprehensive instruction in these complex techniques. The book includes a discussion of the key steps in the preparation, delivery, and evaluation of training sessions for personnel responding to a mass fatality human identification event. It also provides a comprehensive vocabulary list with terms related to mass fatality DNA identification. This text is a must-read for organizations contemplating the use of DNA in human identification initiatives following mass fatalities. It is also a tremendous value to emergency manager/planners, medical legal authorities, and forensic DNA laboratories. Amanda Sozer, Ph.D., president of SNA International, received her B.A. from Rutgers University and her Ph.D. from the University of Tennessee–Oak Ridge Graduate School of Biomedical Sciences at Oak Ridge National Laboratory. Dr. Sozer has worked in forensics for over 20 years, directing forensic laboratories and programs. In addition to directing forensic DNA laboratories, she served as a technical contractor to the U.S. National Institute of Justice (NIJ) and worked on the DNA backlog reduction programs for no-suspect forensic cases and convicted offender outsourcing programs, which resulted in the processing of millions of samples. She has worked on numerous local, state, and federal forensic projects within the United States and forensic projects and human identification initiatives in Guatemala, Cyprus, Iraq, Afghanistan, Jordan, Dominican Republic, Colombia, Lebanon, the Philippines, and Libya.